On Thursday morning Senator Jeff Flake (R-AZ) announced he will vote in favor of Judge Brett Kavanaugh to become the next Supreme Court Justice of the United States. "When Dr. Ford’s allegations against Judge Kavanaugh surfaced two weeks ago, I insisted that she be allowed to testify before the committee moved to a vote. Yesterday, we heard compelling testimony from Dr. Ford, as well as a persuasive response from Judge Kavanaugh. I wish that I could express the confidence that some of my colleagues have conveyed about what either did or did not happen in the early 1980s, but I left the hearing yesterday with as much doubt as certainty." 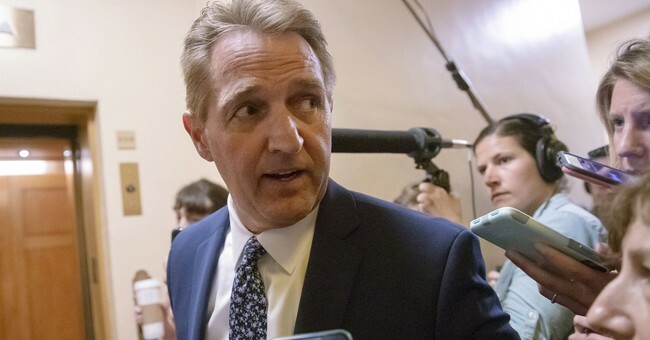 Shortly after the announcement, Flake was confronted by leftists in the halls of the Senate. They blocked his ability to exit an elevator and screamed in his face. Meanwhile, Senators Booker, Hirono and Harris stomped out of the Senate Judiciary Committee this morning and headed for the cameras.